ABBI: Did you hear the news? Health insurance premiums are going up AGAIN – by over 50 percent this time! My family buys our own insurance; how can we afford that? We’ve got to send someone different to St Paul to fix this mess – someone like Matt Bliss. Matt Bliss understands working families can’t afford to keep paying more. MATT: Hello, I’m Matt Bliss. As your representative, I will fight to lower your health care costs. Let’s Put Northern Minnesota First! ABBI: Did you hear the news? Health insurance premiums are going up AGAIN – by over 50 percent this time! As a stay-at-home mom whose husband owns his own business, we have to buy our own health insurance, and I can’t believe how much they’re raising rates – by hundreds of dollars a month on top of last year’s crazy increases! We’ve got to send someone different to St Paul to fix this mess, and that’s why I’m voting for Matt Bliss. Matt Bliss understands working families like ours can’t afford to keep paying more. Matt Bliss will stop wasting money on the broken MNsure website. Matt Bliss will fight to end ridiculous bonuses for failed MNsure executives. 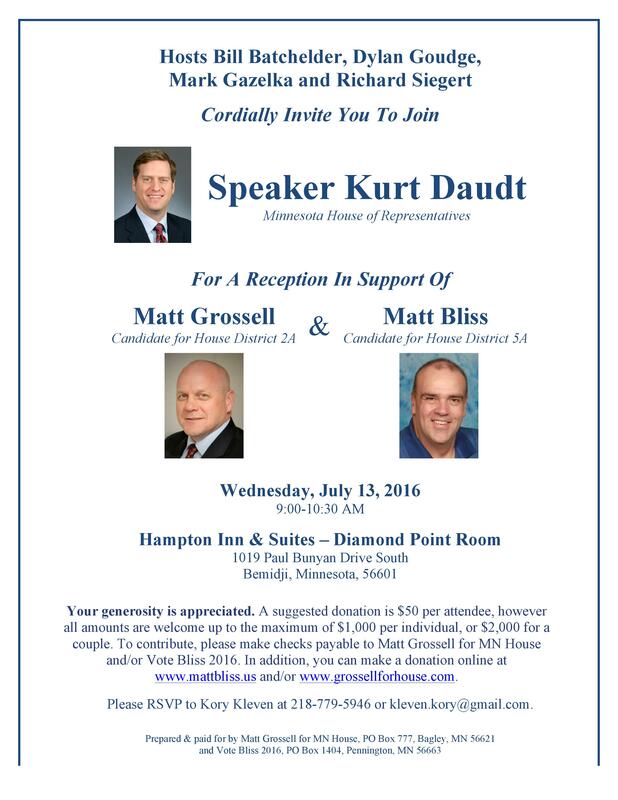 And Matt Bliss will work to cut the MNsure premium tax. He’s on our side, and it’s about time. MATT: Hello, I’m Matt Bliss. As your representative, I will fight to lower health care costs. Let’s Put Northern Minnesota First! The National Federation of Independent Businesses enthusiastically endorsed Matt Bliss today in the the race for the Minnesota House in district 5A. Matt is proud to announce he has been officially endorsed by the Minnesotans Concerned for Life (MCCL) as their choice candidate for District 5A of the Minnesota House of Representatives. Tomorrow, we’ll be airing our first radio spots, you can get a listen here first. It’s time to elect a candidate who is committed to putting Northern Minnesota first. Hello, I’m Matt Bliss, and I’m running to be your state representative. Like you, I’m tired of politics as usual. I’m a political outsider. I grew up in Minnesota on a farm, served in the US Navy and now own a resort and work in technology management. Health care costs are out of control in Northern Minnesota. I’ll work to reduce this burden on families and small businesses in our area – and will fight to stop wasting money on MNsure’s failed website and executive bonuses. Our local economy relies on our abundant natural resources. As an outdoorsman and conservationist, I will support common sense policies that protect our natural resources and way of life, while still enabling job creation and economic growth in Northern Minnesota. Government should also be accountable; it’s time we eliminate government waste and lower taxes on hard-working families. I’m Matt Bliss and I ask for your vote on November 8th. Let’s put Northern Minnesota first. It’s time to put Northern Minnesota first. I’m Matt Bliss, running for state representative. Like you, I’m tired of politics as usual. I’m a political outsider; I own a resort and work in technology management. Healthcare costs are out of control, and it’s time to stop wasting money on MNsure. I’ll use common sense to protect our natural resources while enabling good paying jobs. And I’ll work to reduce government waste and lower taxes to help hard-working families. I’m Matt Bliss. Let’s put Northern Minnesota first. BEMIDJI – Matt Bliss has received the Minnesota Chamber Leadership Fund PAC’s endorsement in the Minnesota House District 5A race. A press release from the organization indicates Bliss was endorsed because of his commitment to economic growth and job creation. Bliss’ family has roots in Beltrami County dating back nearly 100 years. A Navy veteran member of numerous outdoors associations, Bliss has operated the family resort since 2001. As you may have heard, I have decided to run for the Minnesota House of Representatives. I do this with the confidence that I can provide positive solutions and conservative values to the State of Minnesota. Even though we may not agree on all issues, you know me best. You know my family, my work ethic, and my integrity. I think we can all agree that is what we need more of in St. Paul. We are fast approaching the halfway point in this election reporting cycle. Very soon I will need to provide my finance report to the State of Minnesota for the time period of January 1st through July 1st. In order to show my strength as a candidate I would like to raise $5,000 by July. This is the tough part, I am asking you to help me with this goal. If you can afford to donate please consider donating $25, $50, or more (maximum donation is $1,000/individual or $2,000 per couple). To donate, please visit the donation page of my website, Whether or not you can donate at this time, I ask that you please Like & Share this post. The more people we reach, the faster we can reach this goal. Thank you so much for continued support.